Wood Green’s tube station, at the northern end of the high street, is another example of unusual creativity on the Cockfosters extension. 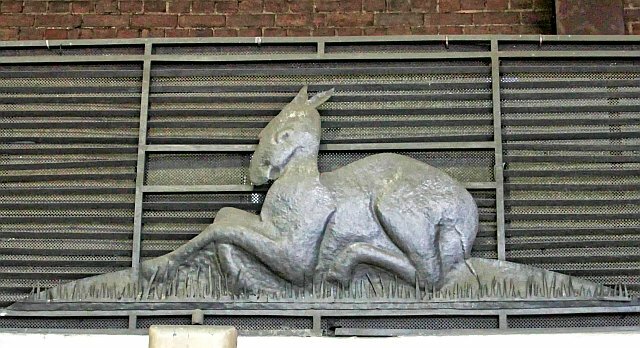 Like the previous two stations, Wood Green has vent grilles on the platforms that depict local scenes, in this case its the now vanished local woods and its animals. Charles Holden however went one step further at this station. The scenes on the aforementioned platform grilles were doubly replicated in the main ticket hall on a gigantic scale. When one enters the station look up to see the deer, trees, grass, and the sun, variously placed around the upper gallery of the ticket hall. The station was originally to be known as Lordship Lane as confirmed when the act to build the line was passed in April 1930. 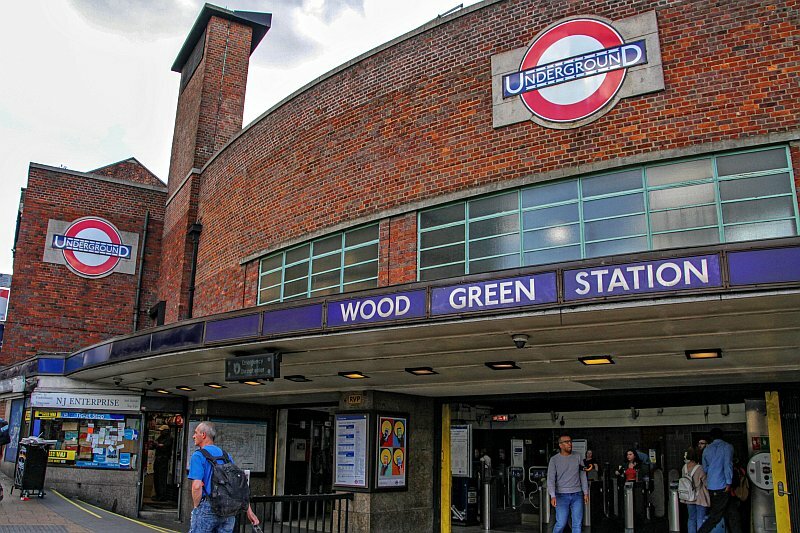 However sometime later in 1930 the name Wood Green was decided upon, presumably to avoid confusion with Lordship Lane station on the now closed line to Crystal Palace high level. The station buildings themselves are listed, however they are not quite so enhancing as the others further north. Its possible the design was dictated by the constrained site available in the 1930s as the main frontage curves in unison with the street. The next two pictures are of the station’s ticket hall and upper gallery at street level. Its impossible to show the ticket hall to good effect even with a 10mm lens. There’s no space for good composition. I took the first picture whilst still coming up the escalator. Two different shots are shown to illustrate Holden’s creativity at this station, including the building’s unusual shape. Wood Green’s stupendous ticket hall with its images around the upper gallery. Another view of the ticket hall at Wood Green. 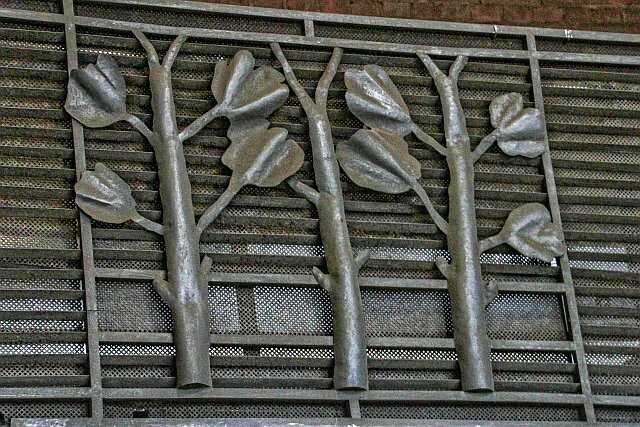 The images depicted on Wood Green’s platform ventilation grilles are repeated within the ticket hall in a much larger size. Its the only station on the Cockfosters extension that takes its images to the next level! Animals such as deer that lived in the woods. The station accommodates a couple of kiosks and small shops, which was standard fare for the remaining ones towards Cockfosters, except Southgate. 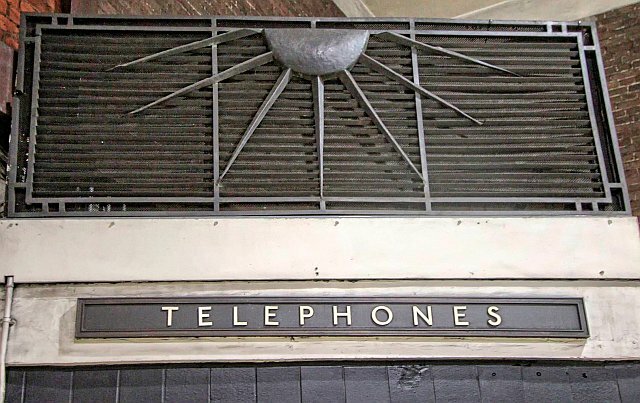 One unusual touch is the former telephone kiosks, so described by the legend ‘telephones’ above the booths. Higher above these is the Sun, with its rays shining down. The Sun shines down upon the old telephone booths. Both Wood Green and Bounds Green’s platforms were the last to be completed on the section towards Arnos Grove. Going down to the platforms the escalator bank are a normal set, nothing special about them. Well not quite! 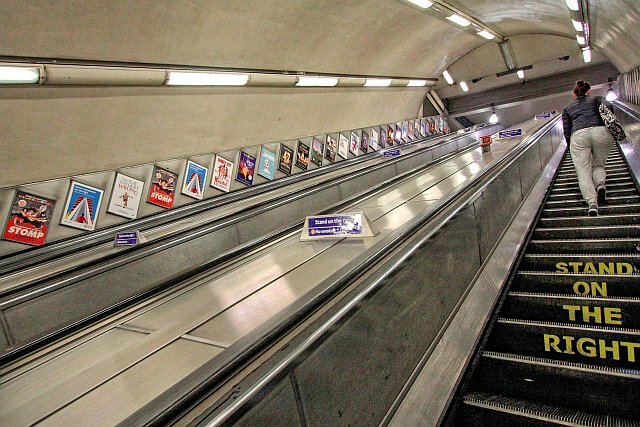 They are the most northernmost bank of three escalators on London’s tube system. Bounds Green & Southgate however are the most northernmost bank of two escalators. In the lower hall is the classic style found along this section of the Piccadilly Line and the platforms are very much the same as the others, with some modifications. The platform colours are green stripes, which would have made Wood Green instantly recognisable to tube passengers who were unable to see the actual station name. The use of stripes is very unusual but clearly attributable here because of the connotations to the name itself. Obviously it represents the trees & leaves in the woods. The entire station has its own completely individual identity at both platform and street level though the impact of that is somewhat lessened these days due to modernisation. Service to Cockfosters arriving at Wood Green. Note the plates covering where the old platform ceiling lights were sited. Wood Green’s green stripes. The marble effect on the walls is at each of the underground stations on the extension, although the ones here seem to have suffered some deterioration of sorts. 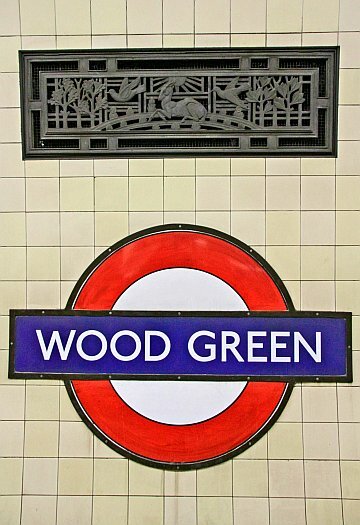 Platform roundel with the woods depicted on the grilles. One thing I have not mentioned before now, but applies to all the underground stations on the extension is they had both platform and track lights. They were rectangular drop shades with brass surrounds. The remains of the holes for these can be seen on either side of the tracks. However for some reason the metal plates used to cover the holes at Wood Green were somewhat thicker, hence the former positions of the downlights are easier to see here than at the other stations. Many of these down lights were taken out of use by early 1942. This was due to the war effort and the need to reduce energy. At this time LTPB were experimenting with fluorescent lighting and once a decision had been made to roll out this type of lighting across the network, the remaining platform downlighters were removed. It must be mentioned that the canopy at the entrance to the station once used the very type of downlight the same as the now vanished 1932/33’s platform lighting. There are still a handful of examples of these once numerous lights at Southgate station. The station canopy has examples of the old lighting originally used here in 1932 for the platforms. Wood Green was once a more busy station than it is now. It had mess rooms for train and platform staff, all now locked out of use unless otherwise needed. These were to facilitate the use of Wood Green as a turnback point, which it most certainly was at one time with several trains an hour terminating here. The introduction in 1952 of the all day two and half minute interval service (peaks excepted) between Acton Town and Wood Green saw a huge increase in the number of trains terminating here. The present day Piccadilly cant even maintain an interval anywhere near those old frequencies. Despite sending most trains to Cockfosters to prevent them clogging the line further back, a considerably poor service ensues much of the time. Both the Bakerloo and Piccadilly Lines once maintained train intervals that are quite near to those levels now ironically being celebrated on the Victoria Line. Mr Wood Green – aka Dave Pillay. This plaque can be seen on the northbound platform (that’s eastbound in tube parlance!) After leaving his post here, he became operations manager at Earls Court. Other than the plaque there’s little information about him. When one considers the dates shown, by the time he went to his posting at Earls Court in 2002 he must have been quite an elderly member of tube staff. A branch from Wood Green to Alexandra Palace was originally mooted when the Cockfosters extension was being built and the idea was brought up once again during 1940. This page gives details of this, plus the various bombings during WWII that seriously affected the stations along this section of the Piccadilly Line. Wood Green was the line’s terminus for two months after a bomb hit Bounds Green on 13th October 1940, extensively damaging that tube station.